Down to a dreamlike dullness. In quiet dream-life rest content. Thank you so much for a lovely Spring Fair. 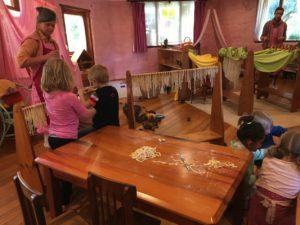 It was lovely to see the children’s garden and café humming along. Thank you, juggling these extra tasks with little people can be quite onerous- your effort is very appreciated. 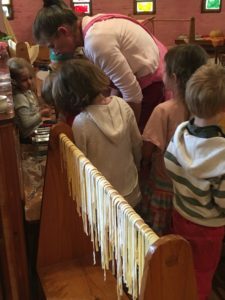 The magic of inside play/ making pasta continues. 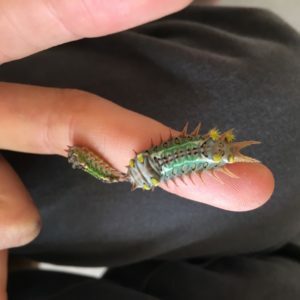 Such fun for the children. We are very lucky that a white plumed honeyeater has built its tiny, delicate nest just outside our bathroom door. If we are very quiet we can see the mother and father bird feeding their babies. 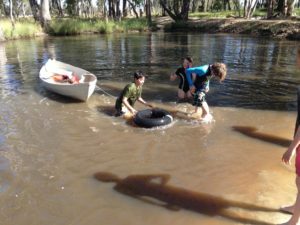 There have been some special events in Prep this term. 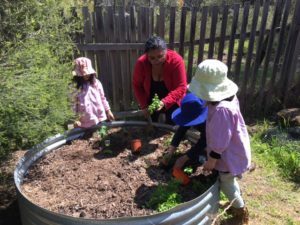 Our class Working Bee was very successful. 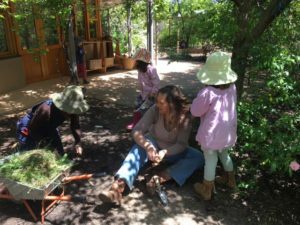 Once again the children enjoyed working with parents to weed, plant vegetables, mulch trees, rake out our chicken house and give the chickens fresh straw. Our garden now looks very neat and happy. 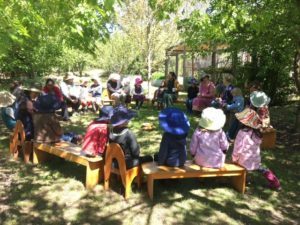 We also enjoyed morning tea and a story together. The children had a wonderful experience when Ron, Sarah and Lewis (Class one) visited us in Prep. 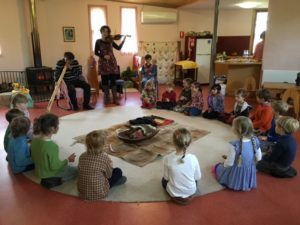 We listened to music, Ron played the didgeridoo, heard tales of indigenous culture and a story, played the clapping sticks and Lewis taught us some dances. You will receive an email newsletter soon with important information about the remainder of the year. We have been enjoying creating a “chocolate factory” with much mud! Many skills are being practiced daily – negotiation and compromise, the art of conversation (listening, hearing and speaking) use of space, proportions of water to mud for the best chocolate or jelly like chocolate, weight and capacity, geometry, sediment at the bottom of muddy washing up water and why, as well as the contribution of lots of tiny insects to the earth and of course lots of fun! Along with this learning we have been completing our Numeracy Main Lesson with Emily Equals and how she balances. We have also been writing and picking out the words we know that are inside other words – a much loved activity. Practise for our first Play Presentation is happening with great enthusiasm! We are practising for our class play everyday now. Thank you for supporting your child to learn their lines. We have amended our performance date (because of the change in the Greek Olympics’s date) to Thursday afternoon the 1st December, with a possibility of attending a full dress rehearsal Wednesday morning the 30th November. Please make an appointment for a Parent Teacher interview to discuss your child’s report. There are limited times available on Thursday afternoon 4pm – 6:30 otherwise Friday 25th November which is a pupil-free day for this purpose. Our end of the year excursion on Tuesday 6th December will be a combined trip with class three pupils and parents. I will let you know the details as they are confirmed. Please support your child’s emotional wellbeing with early bedtimes during this busy social time of the year. We are working through costumes these next few days and we will send home a note to help with finalising your child’s play costume. Lastly, I would like to thank Cassia and the team of parents for all their effort and hard work with our class’s contribution of the tie dying activity which was enjoyed by many on Fair day. 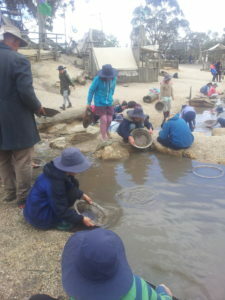 Class 3 are have been on a sleepover camp at Amanda’s farm in Tylden this week. We look forward to hearing all about their adventures when they return. 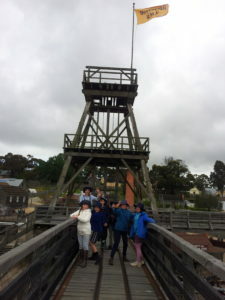 This week, Class 4 has been looking at Gold and its contribution to the Castlemaine township (& other Gold towns). We have held a 200g nugget that was found in this area and felt how heavy it was. 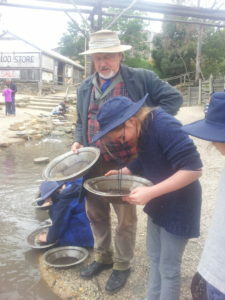 Kate got to hold a 3kg gold block that we saw poured gleamingly into its mold at Sovereign Hill. 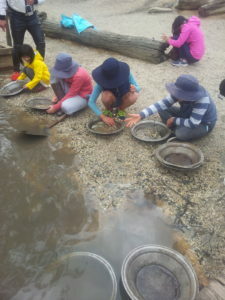 We also found gold in the river – never has there been such focus and concentration! A great team effort! We shall end our year with a Freehand Geometry Main Lesson and a visit to our pen pal buddies at Briar Hill Primary School in Melbourne. Thank you to those who made it to our last Class Meeting for this year. We enjoyed a wonderful session with Libby, experiencing some of what the class does with her in our classroom music session and we had an interesting and useful discussion on social media and teenagers around the cake filled table. Thank you very much to our Class Carer for this year, Edwynna and her support person, Salonika. I’m enjoying working with our children so much. Thank you for your support and communication! What an interesting and event-filled time we’ve had together so far! 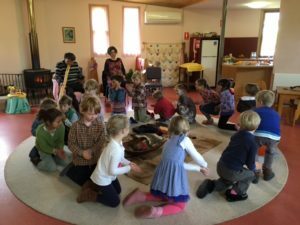 Camp, Spring Fair, and a wonderful soiree. How lovely it was to see the children perform their pieces with such confidence, and to witness their developing musicality. Many thanks to Libby, Jeanette and Leonie for making it all possible! For Main Lesson we have been learning about Perseus, son of Zeus and Danae. We have heard about how strong, brave, wise and handsome Perseus was, and we have heard of how, with the help of the gods, he took Medusa’s head, turned Atlas into a mountain, and rescued a princess by slaying a sea monster. We have also been preparing for the Ancient Greek Olympic Games, practicing javelin, discus, long jump and wrestling. 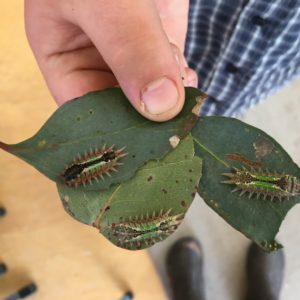 Much love and devotion has been received by some stinging joeys which have spent time in Class Five. Hello to Prickles, Percy, Marsoline, Lime, Avocado, Spike-Out, Giaant, Sage, Basil, Lilycron, Eucalyptus and Mountain Stream, to name just a few. I had never realised how individual stinging joeys are in their markings – apparently in personality too! Our Class Meeting will be held on Tuesday 22nd November, at 7:30pm. Looking forward to seeing you then. 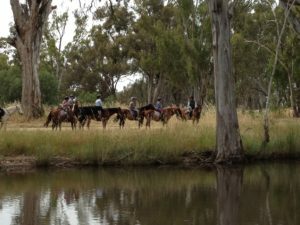 Photos from the recent Class 6 Horse Riding Camp in Strathmerton. The Art and Craft Exhibition was a great success and it was a pleasure and honor to set up. A huge thank you to all the children who brought their craft pieces to school so I could exhibit them. Alison Woodhouse, an ex-parent and talented graphic designer, created the brochure for the exhibition, a huge thank you to you Ally. Thank you to Iliah and Lulu Carolan (my daughters) who spent hours in the space helping me fine-tune the exhibition and to the Class 7’s who helped me set up the furniture and blu-tack the multiple pieces of art. We are nearing the end of the year, classes and projects. Whatever is not completed this year will be worked on next. It is not a pleasant end to the year if children are worrying about unfinished projects. Enjoy the warm weather and the last few weeks together. This is an amazing school that produces not only amazing work but also amazing individuals. I am preparing myself for the departure of the Class 8 students. 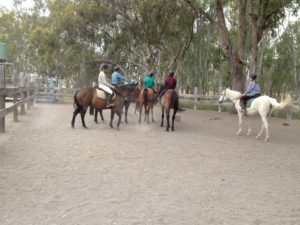 This week we look forward to welcoming Class Six back from their horseriding camp. We are hoping to extend our topic Le Jardin: The Garden, and take a broader look at the seasons in general as well as some expressions for different types of weather. Class Six are now very competent at counting to vingt – twenty – in French and several of our songs are reinforcing their vocabulary for parts of the body, from La Tete, les Epaules, les Genoux, les Pieds (Heads and Shoulders, Knees and Toes) and Savez-vous Plantez les Choux? – in which we are planting cabbages with hands, feet, elbows and (by far the most popular) – la derriere! – right through to the traditional song Alouette with feathers plucked out all over the place! Class Eight have a very busy schedule in these last few weeks but are managing to join with Class Seven in a storybook making activity which combines Main Lesson themes from both groups. For Class Seven, who have been looking at combustion in their science class, and for Class Eight, who have been exploring steam power as an early feature of the Industrial Revolution, we are learning about the amazing hot air balloon exploits of the Montgolfier brothers in 1783. All very interesting! I am very much looking forward to attending my first Greek Olympics in Ballarat on Tuesday 29th November with Class 5. Kate Dew and Class 5 children have preparing medals and costumes for the wonderful day. It will surely be a very special experience for all involved. Parent-Teacher Interview sheets can be found outside the office now but due to my office commitments next Friday, I am asking parents to leave their name and number should they wish to arrange a time to discuss your child’s physical education. I will contact you to make a time that suits all. It is expected to be very hot on Monday for the Spring Games and with that in mind and summer fast approaching, please remember to be sun smart when playing outdoors: hats, sunscreen, long sleeved clothing, plenty of water and shade, etc. Day to raise money for OrphFund, a locally based charity supporting the education of vulnerable children overseas. Students are encouraged to come to school in their PJs with a gold coin donation. Instead of school assembly, we will gather on the primary oval for a morning of traditional spring games. Parents are most welcome to join us to share the fun and cheer along. At 10am, following the games, parents are invited to stay for morning tea at the Parents Room as we introduce our new school principal, Brian Dodd. Peter Foran has been a member of our school community for many years, so it is with sadness that we have this week accepted Pete’s resignation from his role as Sites and Ground Supervisor. We know however, that his presence in the school will live on in the many beautiful creations he has made, and in the many warm memories we have of his time spent here. 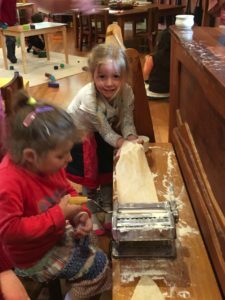 “My eighteen or so years with the School has been deeply fulfilling in many ways. Everything about the school; it’s beauty, both physical and spiritual, it’s philosophy, the people, the curriculum, camps, music, singing, drama (off the cuff and scripted), and the work I have done here, all make up a very special kaleidoscope of beauty, growth and memory within and will hold a very special place in my heart evermore. My contribution here has always felt completely aligned with a higher purpose. It surprises me that I have discovered an even higher one to which I am called. There are so many lovely things coming up as we head towards the end of the year. Next Monday (21st November), children have been invited to wear their pyjamas to school and bring a gold coin donation to support the work of local children’s charity Orphfund (see orphfund.org for information about their work). The fun will continue with a few spring games over on the junior oval. Parents are most welcome to stay after drop off and help out or cheer the children on. From about 10am, we will be hosting a casual morning tea to introduce parents to Brian Dodd, our new Principal. The weather looks like it will be lovely so we’ll be setting up outside the kitchen. The following Wednesday (23rd November), we’ll be weaving willow advent wreaths as a gift for each classroom. You are welcome to join us in the Parents Room from drop off until noon. Lunch will be provided. If you have access to bendy lengths of willow, please let us know. Coming up on the last day of school – before the final assembly (precise time to be advised), we’ll be setting up a few tables to to give parents an opportunity to buy items made by other parents. If you have some beautiful things you would like to sell – perhaps as gifts or seasonal decorations – please get in touch with Aleesha (0421 845 757) or Julie (0420 318 255) for more information. There won’t be any charge for selling your items from the table and you don’t need to be present if it’s not convenient. On a more prosaic note, the lost property pile is growing – there are heaps of jackets and tops that have been discarded as the weather warms up. There were also a few things collected after the Fair. Please have a look on the table in the Parents Room to see if your child’s clothes are there. Thank you for the support for our chocolate fundraiser. Almost all of the 800 bars of chocolate have been sold! Remaining bars will be available for purchase at the office over the next few weeks. We’ve already been able to purchase soup pots for the kitchen and we’ll aim to have shade in place for the Parents Room playground before the summer months. Lastly, you may not be aware that the Parent Craft Group has a glass display cabinet in the foyer of the office. Beautiful dolls, felt and other treasures are available for purchase from reception anytime the office is open. Two of our students and brothers, Leo and George, from Kinder and Class 2, were the youngest competitors to finish the recent ‘Race the Train’ to Maldon. What an achievement! Well done boys. 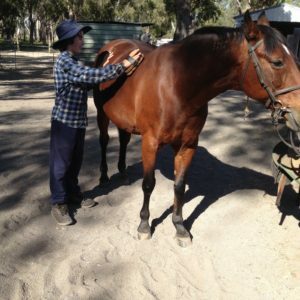 This course will go ahead subject to enrolments; we will confirm this in the first week of February- therefore if you are thinking about doing something inspiring and nourishing for yourself in 2017, we urge you to enrol on line as soon as practicable (see the ‘Part-time courses’ page on our website). Cost: $ 1400 per year payable over four terms ($350 per term) which includes administration and enrolment fees. 1/2 size and 3/4 size cellos – Beautiful resonance. Please ask Libby for a view/hearing. 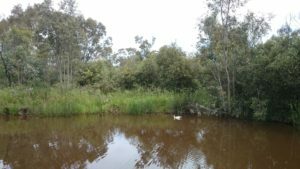 I’m a Celebrity – Get Me Off This Planet! : Come dressed to attend “The Greatest Moments in TV and Movie Awards”. One Small Thing: A collection of devised theatre, music and songs. Castlemaine Press, Lot 19, McShanag Drive, Castlemaine. Each workshop $60 for two (child & adult). Materials included. Call or email if you’d like to join our focus groups. Or you can share your experiences via survey, email or over the phone. 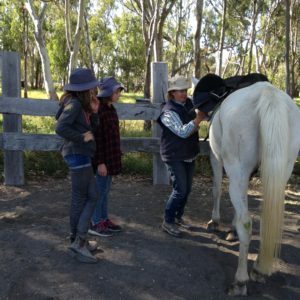 Consulting in Woodend 7th December, 2016. Intensives incur an extra cost to cover catering and accommodation.